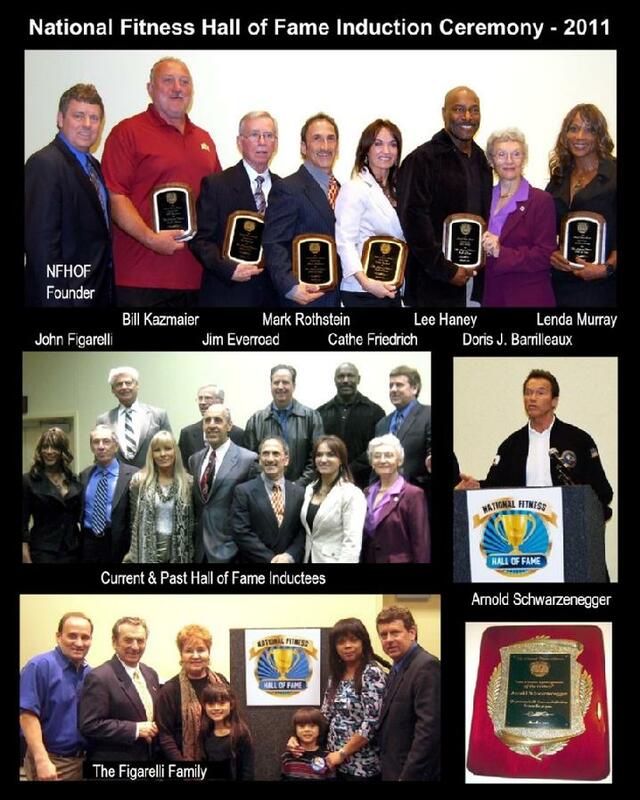 The 2011 National Fitness Hall of Fame Induction Ceremony a Huge Success! A crowd of over 175,000 fitness & bodybuilding fans packed the Columbus Convention Center last weekend for a very special event. The 2011 National Fitness Hall of Fame Induction Ceremony which is typically held in Addison, Illinois, was moved to Columbus, Ohio in conjunction with the Arnold Schwarzenegger Sports Festival Weekend. Friends, family members and fans traveled in from all across the country to welcome in the Hall of Fame Class of 2011. The inductees in attendance included the following professionals: Doris J. Barrilleaux – Jim Everroad – Cathe Friedrich – Lee Haney – Bill Kazmaier – Lenda Murray – Mark Rothstein. (The late Joseph Pilates was also inducted). This year’s Master of Ceremony, Dr. Bob Goldman (a 2006 HOF Inductee) presented two special awards. The 2011 “Lifetime Achievement Award” was given to 2009 HOF Inductee, Jim Lorimer and the distinguished “Fitness Spokesperson of the Century” Award was presented former governor, Arnold Schwarzenegger who has devoted most of his life promoting fitness. Sue was also equally impressed, saying, “First, let me extend a HUGE thank-you for the fabulous weekend and the opportunity to be there! It will be a weekend I will not forget. I had the privilege of meeting extraordinary people who have contributed so much to so many! Thanks to our volunteers for helping to pull this all together: The Figarelli family, Donald, Julia, Don Jr., Fatima, Isabelle & Nicholas and our to our sponsors; Total Gym Company, Egglands Best, and Dr. Bob Goldman. First let me say it was nice meeting you and I have much appreciation for the hard work and loyalty you demonstrate to this event (The National Fitness Hall of Fame).As a personal friend of Mark Rothstein I want you to know what a dedicated and loyal inductee the Hall of Fame has in Mark. As you have learned in just a short time Mark is a humble and loyal person and he demonstrates this in his work ethic and personal commitments. My wife and I enjoyed the event and the people we met are great contacts/friends I hope forever. The Friday night "Meet and Greet" was a great opportunity to interact and meet not only the inductees but their family and friends. Saturday’s event was exciting in the fact that the room was filled with a number of individuals that had dedicated their life to motivating, promoting, and informing our country about the benefits of Health and Fitness, a message that is so important to both the young and elderly. John your hard work is appreciated and the new members of the National Fitness Hall of Fame will be great additions to the field of Fitness. Continue to tap these sources to promote the message.